13 Easy French "Survival" Phrases, just for you! Save this image to your phone or wherever you're looking at this from. 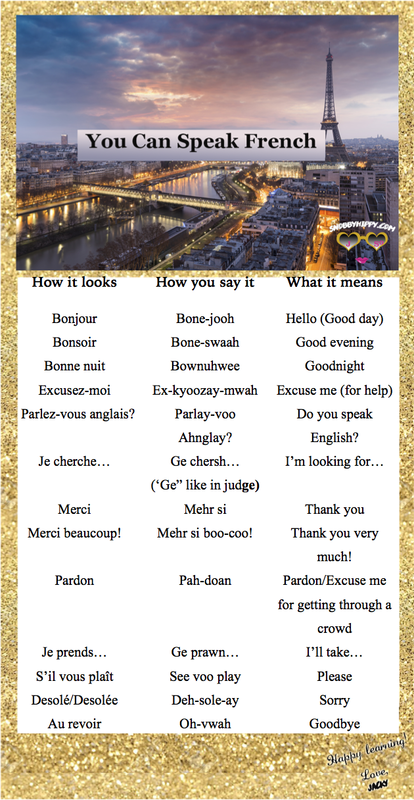 Break it out when you need a little pronunciation cheat sheet, and have fun! If you have no previous background in French and can't do the soft, gurgl-y, French Rs yet (sounds like "air")...you can attempt to roll your Rs or try the phonetic spelling I made for you above. And please, let me know what you think. If you like this, I'll come up with more!